Executive Director Alice Azumi Iddi-Gubbels was born in Bongbini, a small village in the East Mamprusi district of northern Ghana. After graduating from the University of Ghana, Alice led a community based health project in her district. Subsequently, Alice obtained a Master’s Degree in Social Development Planning and Management, and worked with World Neighbors, Oxfam and the Catholic Organization for Development & Peace. In 2003, Alice earned a second Master’s Degree, in Early Childhood Education and certification in Montessori Teaching at Preschool and Lower Elementary levels, from Oklahoma City University. Alice taught at Westminster School in Oklahoma City until 2007. 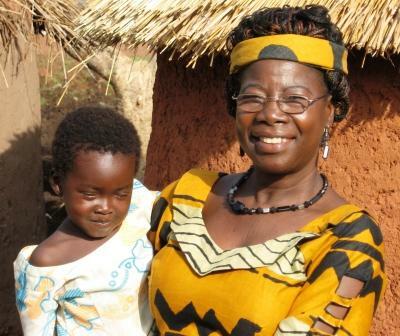 In 2008, Alice founded PAMBE Ghana and returned to her native village to start La’Angum Learning Center. Alice Iddi-Gubbels’ interest in promoting bilingual education, starting with mother tongue education, was rooted in her own primary school experience in her native village of Bongbini in the East Mamprusi district of northern Ghana. When she started school, the use of the local language (Mampruli) was prohibited. Alice and her fellow pupils were instructed entirely in English, a completely foreign language to them. This made school and learning very difficult for most of the young students, resulting in high dropout numbers. This was especially the case for girls, who were needed at home to help with housekeeping and other chores necessary to sustain livelihoods. Of over 100 children that started school with her in her village, Alice was one of three who completed high school and continued to university. Today, she is one of very few in her native district in Ghana with a university education. Based on her extensive community development experience at home and what she learned about early childhood education in North America, Ms. Iddi-Gubbels developed a vision and a strategy for improving primary education in her native district.